With John Redwood being lauded by Peter Oborne - always a bad sign, we have the man himself telling us that "the EU's single market destroys jobs". 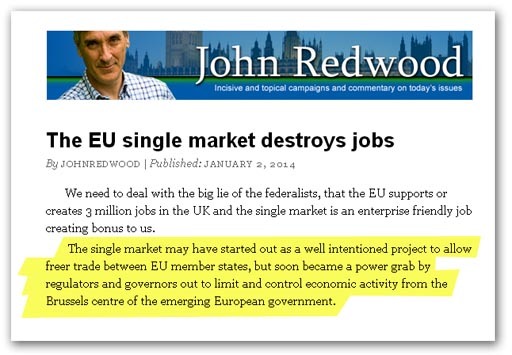 "We need", says Mr Redwood, "to deal with the big lie of the federalists, that the European Union (EU) supports or creates three million jobs in the UK and the single market is an enterprise friendly job creating bonus to us". But then, to balance this "big lie", Redwood offers his own. "The single market", he informs us, "may have started out as a well intentioned project to allow freer trade between EU member states, but it soon became a power grab by regulators and governors out to limit and control economic activity from the Brussels centre of the emerging European government". This is the classic Tory myth, trotted out again and again and again. And this is why there remains such traction in the "renegotiation" meme. There is this unshakable delusion that the "Common Market" started off with good intentions and somehow went off the rails. By this means, the Tory "eurosceptic" can afford to be critical about the European Union – but this is never really directed at leaving. Merely, reinforcing the myth, they believe that, if the EU can somehow be restored to its original path, everything will be "cool". In Mr Redwood's case, it is not as if the truth has not been put to him, several times, and to his face. If he applied his undoubted intellect to carrying out his own research, he would come to the same conclusion. Of course, Mr Redwood doesn't, and neither do so many of his colleagues. If they accepted the truth, they would have to come to the same conclusion, the only possible conclusion – that we should leave the EU. This is something though, that they simply cannot countenance. So, while parading the EU's "big lie", they nurture their own. And this is why we can never get any sense out of people like Redwood. They are living their own lie.